Since the release of “PYP: From principles into practice”, IB World Schools around the world have been engaging with the content and planning for implementation. Four schools at different stages of their IB journey will share their approach to understanding and implementing the IB Primary Years Programme (PYP) enhancements in their own context. Follow each unfolding story over the coming year. Here is the second story in the series that features a candidate school in the USA and illustrates how they began exploring the enhanced content. Our school was formed in 2004 when two smaller community schools in the East Atlanta area were consolidated into one: Burgess Elementary and Peterson Elementary were merged into the new Burgess-Peterson Academy. Our school’s catchment area mirrors the borders of the East Atlanta-Reynoldstown communities within the city of Atlanta. We started our journey on the road to authorization in 2014. After becoming a charter district, our cluster chose the PYP as our signature programme. Our community is particularly interested in and excited about becoming an IB World School. There is also excitement around the IB continuum eventually being in place throughout our cluster. Our school’s vision strives to become “the neighborhood school of choice and a compelling traditional public school option for the child of any family living in East Atlanta Village and Reynoldstown”. Our mission is Burgess-Peterson Academy and its community strive to develop knowledgeable and caring learners, guiding them to become life-long thinkers and internationally minded citizens through engaging, inquiry-based learning experiences. As you can see, we have intentionally aligned our mission to the mission of the IB, because we are a school that is committed to a collaborative approach to developing our curriculum in a way to promote inquiry and the development of value critical-thinking skills that our students will use throughout their lives. We started our journey to authorization under the essential elements of the PYP. I felt as if we were well on our way until the roll out of the programme enhancements began. It was a bit unsettling at first, because we had gotten comfortable with many of the essential elements and so when talks started happening about the enhancements, a little panic set in for me and I thought that we would have to start all over on our journey even though we were so close to our verification visit. Our school system has a District IB Coordinator and we have monthly meetings to discuss different topics and shared concerns from various schools. We are all at different stages of IB implementation, so our conversations are always informative. We can support each other, because someone has already lived through what you are currently experiencing. These monthly meetings have helped me with exploring the PYP enhancements. Every month coordinators guide the discussion and our district coordinator offers insights from multiple perspectives, having being a former IB Coordinator herself. These discussions have eased my fears about transitioning to PYP: From principles into practice. Another practice that has helped us is recognizing what IB programme standards and practices our school needs to address to better advance the IB PYP in our school community. We do this by reviewing our consultation report. One important focus identified is to incorporate more inquiry-based instruction throughout our curriculum. Knowing this, I researched PYP: From principles into practice to make our focus more pointed and intentional. Inquiry in a primary setting has been a helpful teacher support material. After reading it, I gained some insights into some strategies by which to make inquiry more personalized for individual student needs as well as having access to multiple examples of inquiry learning in schools. I also attended a Learning Lab by CASIE (Center for the Advancement and Study of International Education) entitled Inquiry: Not such an intimidating word. This training offered strategies and ideas that I could take back to our teachers for implementation. After attending the learning lab, I prepared and conducted professional learning experiences for our teachers based on the pertinent information that I had received. The success of our programme could not have been possible without the support of my principal, and the support of the amazing teachers of Burgess-Peterson Academy who work so hard to ensure that our students have access to a welcoming and engaging culture in which there is an urgency to maximize instructional time. Our teachers are thoroughly committed to the implementation to the PYP. They come to professional learning open to new ideas and strategies that have advanced learning and teaching at our school. I am truly blessed to have a school that values, supports and is open to change. It has been an amazing ride on this road to authorization! I cannot wait to see what the next year brings. 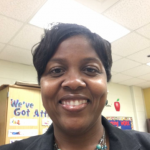 Tracy King has a total of 24 years’ experience working with elementary students and teachers. She has been the IB Coordinator at Burgess-Peterson Academy since 2014. The school is focused on becoming an IB World School. Tracy supports teachers in improving the quality of inquiry-based lessons. She is a proponent for promoting student agency by leading a group of IB Student Ambassadors who are a representative group of students serving as the student voice of Burgess-Peterson Academy. She is passionate about the overall well-being of all students and providing them with an equitable, high-quality education on a daily basis by supporting, assisting, inspiring, motivating and preparing teachers to be catalysts for change. You can follow her on Twitter @IBatBPA. Be on lookout for the third in a series of planning for implementation stories next week. We will share a journey of an IB World School in India.